Box Notes: We’re including 2 bunches of greens in your veggie box this week because the greens season is almost over. We’re thrilled to share that the cherry tomato and frying pepper harvest started last week, unexpectedly early. We will include them in the veggie boxes soon. The cherry toms and peppers usually start in early July but due to mild spring weather and early transplant-ability, the small tomato fruit started to mature very early. Summer squash will also be starting very soon. We are looking forward to the full swing of the harvest of the summer crops. Field Notes: For June, other than the 102 degree day we experienced last week, the daytime temperatures have been mild. The conditions are perfect for the ripening of the Santa Rosa plums, the tomatoes, the summer squash, the peppers, and the eggplant. Our water supply for the summer looks good too. Reliable water releases from Indian Valley Resevoir and Clear Lake are keeping the Cache Creek water levels high enough to ensure a good irrigation flow. Despite a lower than average rainfall year, the reservoir levels are high enough for the water district to release water into Cache Creek until the late fall. Big news! We are excited to announce a new partnership with our fruit farming friends at Frog Hollow Farm. 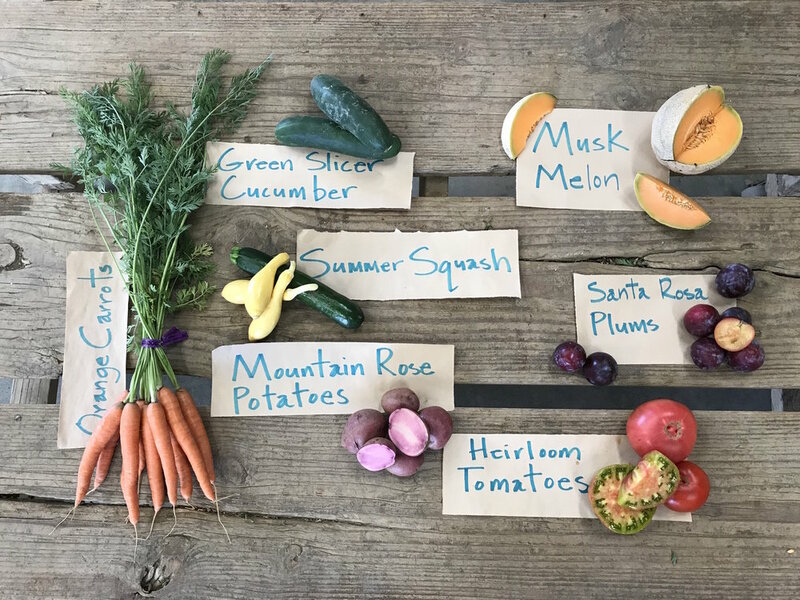 You can now order a Frog Hollow Farm CSA box (or two!) for delivery with your Riverdog Farm CSA Veggie box, or web store order. The catch: you must make your one time or weekly order no later than Sunday at midnight for delivery the coming week. Unfortunately no fruit delivery is available on Tuesdays at the Napa Fatted Calf. Frog Hollow CSA boxes come packed full of 3-4 varieties of exceptionally tasty, seasonal, tree ripened stone fruit. Summer CSA boxes contain 7 lbs. of mixed stone fruit that include many varieties of peaches, plums, nectarines and pluots. Visit their web site: www.froghollowcsa.com to learn more about their CSA program, farm, ethos and fruits.